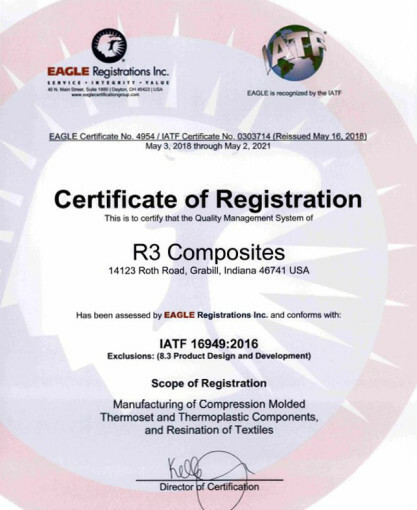 R3 Composites’ primary mission is to provide customers with resinated nonwoven materials and compression molded products of superior quality delivered on-time at competitive prices. This will be achieved through our unyielding commitment to improving our quality management system, meeting applicable requirements, and focusing on relationships with our customers, employees, suppliers and stakeholders. We have strict quality controls in place to assure your product meets or exceeds specifications. In addition we have been certified to meet the requirements of IATF for the manufacturing of parts for the automotive industry, excluding product design and development. When you use R3 Composites as your supplier, you can be assured of receiving quality consistent products at competitive pricing. Call our sales team today to find out more. R3 Composites is committed to meeting or exceeding relevant environmental regulations requirements through continual improvement of its environmental management system and maintaining compliance to regulations. R3 Composites is committed to environmental performance enhancement and pollution prevention by focusing on our relationships with our customers, employees, suppliers and stakeholders.